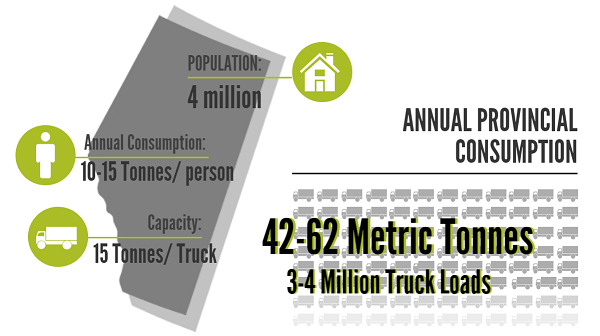 On average, each Albertan uses 10-15 tonnes of aggregate per year - that's equivalent to one full truckload. Aggregate describes sand, rocks, gravel, crushed stone, shale; any rock product that is mined out of the ground. These products are used in all types of construction. Everything from roads, schools, and houses to hospitals, bridges, and water treatment plants require aggregates to be built. As a non-renewable natural resource, much like oil or gas, aggregates must be protected and respected. We can't forget that aggregates are a non-renewable resource. Once land is developed, access to aggregate is forever lost on that site. If an aggregate resources is not developed in your area, aggregate must be hauled in from another site, which could be many kilometers away. The farther a community needs to travel to find aggregate sources for its construction, the more expensive aggregate becomes. If your community does not have access to local aggregate deposits, this means that it will cost you and your community more to pave driveways, build houses and schools, or even fill a child's sandbox. Every kilometre a load travels away from site adds an additional $0.10/ tonne to the total cost of gravel. Additionally, your community will also be subjected to increased vehicle emissions resulting from increased fuel use, and your local roads and highways will experience more wear and tear from the increased truck traffic required to haul aggregates into your area. 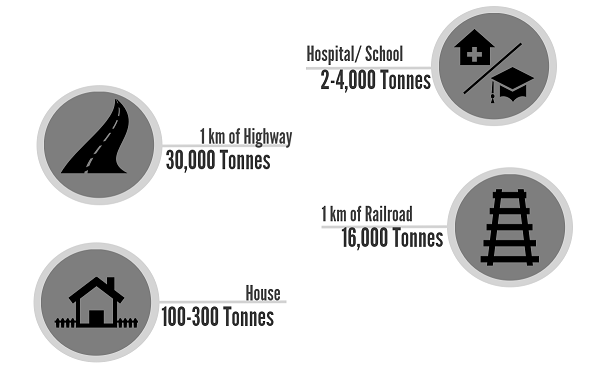 A typical single family house uses about 160 tonnes (that's about 12 truck load) of gravel. You'll find it beneath the basement floor, as drainage rock around the foundation to prevent flooding, in the concrete walls, floors, steps, sidewalk, patio and driveway. Even your home's windows and stucco siding are made with sand. Toothpaste contains talc, which is a product of aggregate mining. The aggregate mining industry is very tightly regulated in Alberta. Companies that mine aggregates must adhere to many environmental laws and regulations. Read more about regulatory requirements effecting the industry here. In one year, Alberta uses enough aggregate to build a wall around the entire province (that's 3,990 km), measuring 3.8 metres (12.5 ft) high by 1 metre (3.3 ft) thick. Construction of a tall office tower uses more than 100,000 tonnes of aggregate, mainly in the concrete. Gravel mining is a necessary but temporary use of land. You may also be surprised to learn that many of Alberta's golf courses, lakes, and parks, were once aggregate mining sites. You can learn more about some of the industry's reclamation projects here.